Honor the enduring love of a gracious God with this Apples of Gold white gold cross pendant. Forged from high quality 14K white gold, this gold cross pendant brings simple beauty to the symbol of Christ's sacrifice. The solid white gold pendant is plain for clean, hassle-free look. The cross pendant is given a little bit of depth, with the center of the cross slightly thicker than the ends of the arms. The entire plain cross pendant is perfect with a smooth finish for a lustrous shine. 30mm x 16mm (1.18" x 5/8"). 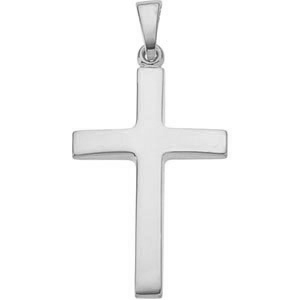 We guarantee our Plain Beveled Cross Pendant in 14K White Gold to be high quality, authentic jewelry, as described above.